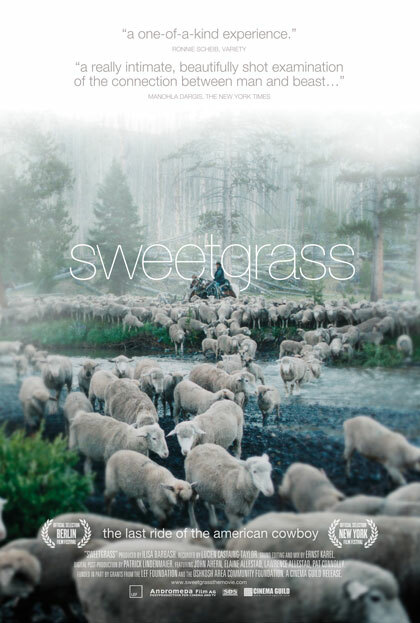 Stunning in its cinematic and observational power, SWEETGRASS is a new kind of pastoral, a visual poem of cultural and historical shifts. Lucien Castaing-Taylor, who teaches at Harvard’s Visual Anthropology department, and Ilisa Barbash, of Harvard’s Peabody Museum, describe themselves as “recordists” rather than filmmakers as they capture a family and their animals in their final season herding sheep in Montana’s spectacular Absaroka-Beartooth mountain range. The herders work like cowboys out of the old West, but unlike cattle, sheep can be hilarious to watch. From the cockeyed sight of a massive sheep drive down a small town’s empty main drag to a herder pouring his heart out on a cell phone at the top of a monumental vista, Castaing-Taylor and Barbash sharpen their sense of humor as well as their all-embracing lens to create an unforgettable cinematic experience.